Last night I made a batch of cranberry sauce. Don’t worry, I realize Thanksgiving is still a week away and no, I’m not going crazy with early prep. It’s actually for a project that you guys will hear about next week. Anyway, it was delicious. It’s also a reminder of how food has changed in my life. When I was a young person, I had no idea what real cranberries looked like, apart from some illustrations on a bottle of cran-apple juice, and for me, cranberry sauce was cylindrical and had ridges. This was just an accepted fact until I actually ate real homemade cranberry sauce. I don’t remember liking it very much. It was too tart and soupy and where was all the sugar?! Now we make cranberry sauce at home every year and once in awhile I will eat out someplace that still uses canned. It’s more a novelty now; like eating Twinkies. Twinkies are pretty gross now to me, as are most of those grocery store goodies I used to crave. This isn’t a rant by the way about processed foods and being a food snob. Mainly standing over the stove making the sauce last night just reminded me about how much I’ve come to appreciate and love home cooked food. Also, that I actually really like cranberries too. And so here is your token cranberry holiday cocktail because Thanksgiving is next week. And… cranberries! In a shaker 2/3 filled with ice, combine sherry, cranberry juice, rum, simple syrup and bitters. Shake well about 20 seconds and strain into a chilled cocktail coupe. Garnish with an orange peel. 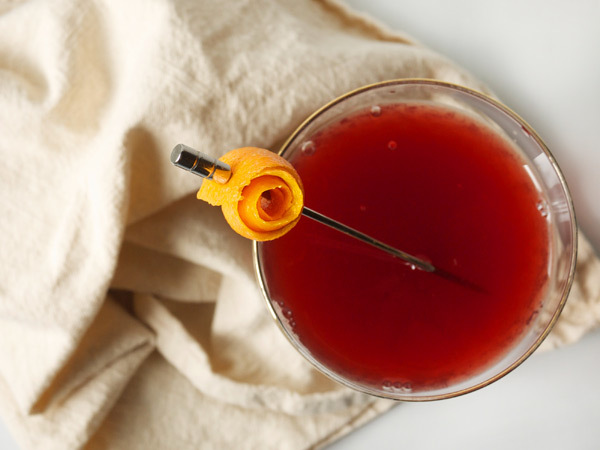 I created this drink for Serious Eats as a lighter, lower ABV cocktail that you can drink at your holiday party and not get tanked with. 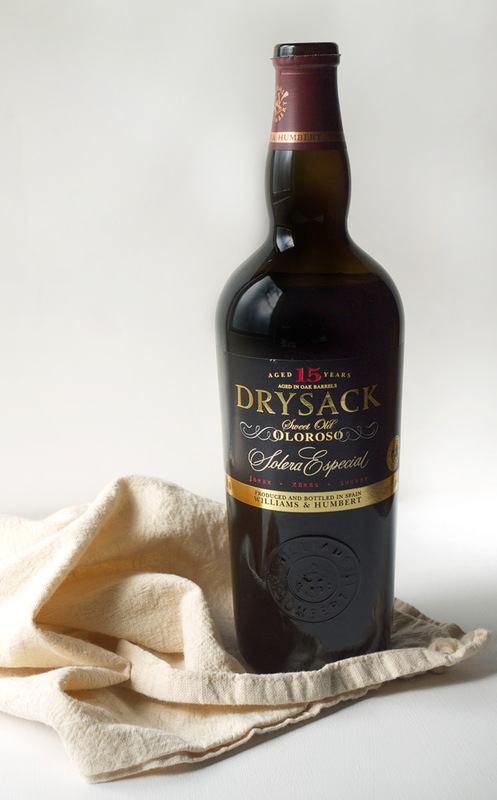 I chose the Dry Sack Oloroso style, with its dry, sweet and nutty profile, as my perfect match for cranberries. 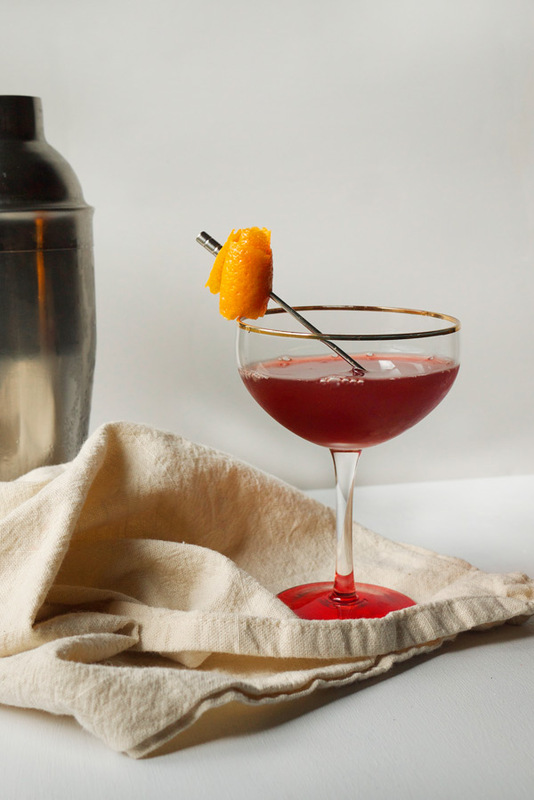 The sweetness of the sherry also balances the lip-puckering tartness of the cranberry juice. And using real unsweetened cranberry juice here instead of a syrup helps to lighten the dense and potentially sticky mouthfeel of sherry. (Using a heavy syrup alongside of an Oloroso might have been, well, too much of a good thing.) Because sherry has only 20% ABV, the drink makes for a nice, lighter alcohol aperitif to start your evening. An extra half ounce of gold rum added to the drink gives more spicy depth to the drink without adding much boozy punch or detracting from the sherry’s flavor.